YouTube’s algorithm doesn’t necessarily favor anti-vaccination videos. In an initial test on Feb. 14, a little over two-thirds of searches for queries like “is it safe to vaccinate my kids” or “are vaccines safe” resulted in a top search result from a professional medical outlet, like this video from Johns Hopkins or this video from the Mayo Clinic. Those videos were followed by recommendations for a video in which celebrity doctor Mike Varshavski discusses another popular video about the vaccine debate uploaded by an entertainment channel called Jubilee. That Dr. Mike video, which was posted on Feb. 6 and currently has more than 2 million views, was consistently followed by recommendations for more popular videos of Dr. Mike. But while in some cases search queries like “should i vaccinate my kids” led to authoritative sources and entertainment, in other cases, the exact same search led down a misleading path. In one instance, after a search for “should i vaccinate my kids,” YouTube played a pro-vaccine video called “Why Are Vaccines Required Before My Child Goes to School?” from the Philadelphia Children’s Hospital but followed it with a recommendation for “Mom Researches Vaccines, Discovers Vaccination Horrors and Goes Vaccine Free.” That was followed by “You’ll Be Glad You Watched This Before Vaccinating Your Child!” from iHealthTube, which was followed by three videos in a row featuring anti-vaccination activists Dr. Sherri Tenpenny and Dr. Suzanne Humphries. In a second set of tests run by BuzzFeed News (also in fresh search sessions with no personalized data) four days later, results like these were even more consistent. In 16 searches for terms including “should i vaccinate my kids” and “are vaccines safe,” whether the top search result we clicked on was from a professional medical source (like Johns Hopkins, the Mayo Clinic, or Riley Hospital for Children) or an anti-vaccination video like “Mom Gives Compelling Reasons To Avoid Vaccination and Vaccines,” the follow-up recommendations were for anti-vaccination content 100% of the time. In almost every one of these 16 searches, the first Up Next recommendation after the initial video was either the anti-vaccination video featuring Shanna Cartmell (currently at 201,000 views) or “These Vaccines Are Not Needed and Potentially Dangerous!” from iHealthTube (106,767 views). These were typically followed by a video of anti-vaccination activist Dr. Suzanne Humphries testifying in West Virginia (currently 127,324 views). A channel called VAXXED TV posted the video of Humphries testifying; in every one of these 16 searches, YouTube ultimately ended up recommending VAXXED TV videos on repeat. The VAXXED TV channel has 54,000 subscribers and describes itself as as a promotional channel for a 2016 documentary directed by infamous anti-vaxxer Andrew Wakefield that claims to reveal “how the CDC destroyed data on their 2004 study that showed a link between the MMR vaccine and autism.” That film, produced by Polly Tommey and Brian Burrowes, was yanked from the 2016 Tribeca Film Festival and got one of the filmmakers banned from Australia after a promotional tour. Nonetheless, the film developed a popular following, and its creators have so far raised $86,000 via Indiegogo to produce a sequel. The information panel on this VAXXED TV YouTube video says, “The MMR vaccine is a vaccine against measles, mumps, and rubella” and links to the MMR vaccine Wikipedia page. 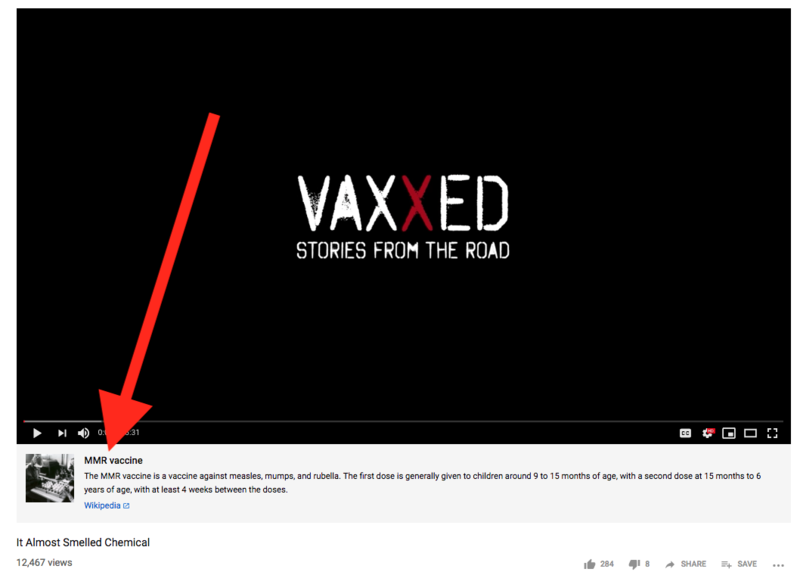 Some of the VAXXED TV videos most frequently recommended by YouTube’s algorithm following vaccination-related searches included “ MERCK’S DIRTY LITTLE SECRET – BY DR. SUZANNE HUMPHRIES,” “It Almost Smelled Chemical,” “Nobody Warned Me!” and “They Know.” Two of those videos (“Nobody Warned Me!” and “It Almost Smelled Chemical”) specifically mention the measles, mumps, and rubella vaccine, or MRR. Because the video descriptions mention MMR specifically, YouTube added an information panel that explains what the MMR vaccine does and links to more information on Wikipedia. YouTube does this on videos explicitly mentioning common conspiracies, such as climate change denial or the idea that the moon landing was fake, but doesn’t do it for anti-vaccination content more generally. In 25 additional tests on Feb. 19 and 20, YouTube didn’t recommend VAXXED TV videos, instead overwhelmingly recommending the same entertainment videos from Dr. Mike and Jubilee (in addition to some outliers, like “Autism Didn’t Exist Before 1943?” from the Real Truth About Health channel). Videos by Jubilee, which has 2.5 million subscribers, claim to “bridge people together, challenge conventional thinking, and inspire love.” Jubilee’s video on the vaccine debate — “Pro-Vaccine vs Anti-Vaccine: Should Your Kids Get Vaccinated?” — popped up frequently in BuzzFeed News’ queries and currently has 1.9 million views since it was posted two weeks ago. It also doesn’t definitively say whether vaccines are safe or not. Anti-vaccination videos on YouTube fit this criteria. They are highly emotional, often featuring parents talking about their sick kids. They also have an element of conspiracy — the theory that the government and medical profession have conspired to keep the relationship between vaccines and certain diseases a secret — that draws the viewer in and provokes debate. This makes these videos like catnip to YouTube’s recommendation algorithm, which seeks out and feeds on user engagement. That kind of organic algorithmic lift can be difficult to compete with, even with better content. There is no organic community of regular people creating pro-vaccine videos, no enormous Facebook group where parents whose children died of vaccine-preventable diseases gather to talk and share links. Some of the anti-vax videos on YouTube are genuine conspiracies, and those are likely to be affected by YouTube’s recent tweaks. But it’s the steady stream of videos of crying parents who genuinely believe vaccines harmed their children that keeps the movement boosted via YouTube’s algorithm — and it’s not clear what YouTube plans to do about those.